The ride through the valley gorge of Greolieres can be part of the approach of Col de Bleine , Col de Castellaras, (or sevaral other passes), but it doesn't have to be. You can also ride any of these three without any of the other two on this dense network of small, superbly paved roads. The route over just this summit point is located on a shoulder of the other two (ie. you don't drop more than 300ft or ~100m) to keep climbing to the higher points. It is fairly difficult to make this point the highest point on a loop ride. The profile below is about the only option I can find, and even then it goes over another point, whose altitude is within the margin of error. From East. To give this profile a resepectable elevation difference, I started it in Gorge du Loop. I did not ride that part. I came onto the route at point 2, after descending Col du Vence. I spent the night in Greolieres and then discovered the picturesque route with the birds eye view of Greolieres and Cipieres in the new light of the next sunny morning. Between here and the summit the road goes through 3 short tunnels. After coming up from the busy coast this really was another world, removed from all the traffic and frantic noise. At the top of the plateau the route turns away from the gorge and enters a high forested plateau, the Plan du Peyron. Hard to tell exactly where the highest point is while on the bike. But according to the map, it is just before a modern billboard advertising in graphic detail the mountain biking and skiing possibilities in Greolieres Les Neiges. The turnoff on the right to the out and back climb follows immediately afterwards. Looking to the left as the road turns away from the gorge, you can also make out the hill of another ski area at l'Audibergue. The turnoff point to Col de Bleine and Col de Castellaras is nearly as high as the summit. From West (described downwards). The descend through Valderroure on a pleasant forested, straight road is so gradual you hardly notice it. 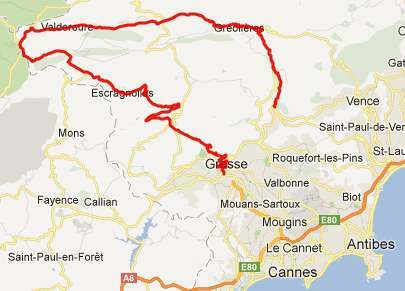 In order to continue downhill the profile proceeds through Seranon, Escragnolles, Saint Vallier de Theiy to Gras. My own route stayed on the plateau a little longer, and crossed another small unnamed summit on D452 direction Castellane. D452 Peyroules(sh), D2 Clue de Greoliere(sh), Col de Luens: Greolieres > D2 Clue de Greolieres/Plan du Peyron(sh) > Valderoure > D452 Peyroules s(u)-(sh) > route du Napoleon > col de Luens > Castellane <> maybe 15 miles of out and backs around Castellane: 51 miles with 3368ft of climbing in 4:46hours. (VDO MC1.0 m4:12.5.17) This includes about 15 miles of out and backs around Castellane.